The perfect lightweight, go-anywhere hammock. Lightweight, packable, easy to set up, the Overland Hammock was designed for the needs and desires of the modern adventurer. From car glamping to breaking your own trail or simply finding two trees in your favorite spot in city, our products are designed to enhance your experience along the way. 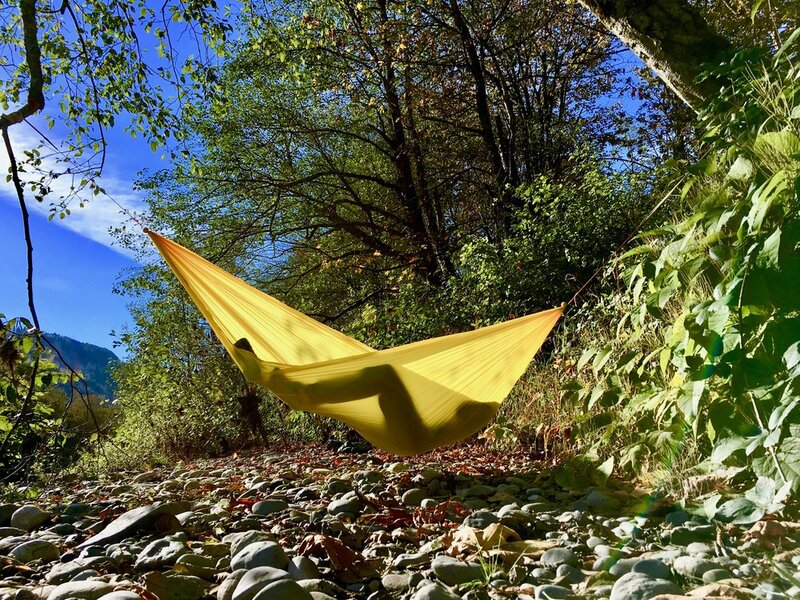 The Overland Hammock and its quick-setup allows you to hang and relax in minutes. The Overland Hammock is designed with quick easy setup in mind. Click to learn more. Hang and relax in style with any of the Overland Hammocks cut from the finest materials with beautiful colors. Our commitment to simple, well-designed hammocks ensures you have just the essentials for a great hang. Light and Packable - Packs down smaller than a can of beer and weighs only 7oz. The Ultralight Overland Hammock is so small you never have to worry about whether you have enough room in your pack or not. It fits in any bag you bring with you allowing for a hang whenever the inclination strikes you. We love to hear from Overland lovers. Customer elation and feedback keeps us motivated to design more and better things. Here is some love from early customers praising our hammocks. If you want to let us know how you feel (about our hammocks), do so here. The perfect hammock for you.